Source photos of Rob and Doug Ford by Christopher Drost/Torontoist. Howland pictures courtesy of Wikimedia Commons. Click to zoom in. A father who served as an elected representative. Run-ins with an unyielding city council. One sibling removed from office for legal reasons. The Ford brothers, right? Yes, but these characteristics also apply to the only pair of brothers to have sat in the mayor’s chair (so far), William Holmes Howland (served 1886 to 1887) and Oliver Aiken Howland (served 1901 to 1902). Rumours regarding Doug Ford’s intentions to run for mayor if a by-election is held to replace his judicially ousted brother inspired us to take a look at the Howlands. While there wasn’t an official “Howland Nation,” William built a strong constituency among the working class in the mid-1880s by supporting labour movements and pushing for reforms to social welfare and public morality—reforms that eventually gave birth to “Toronto the Good.” William’s removal from office in February 1886 was due to an effort by supporters of defeated former mayor Alexander Manning to prove Howland didn’t own land, which at the time was a requirement of the mayoralty. Some speedy legal work, combined with no nominations for a successor, saw Howland back in office after a week’s exile. 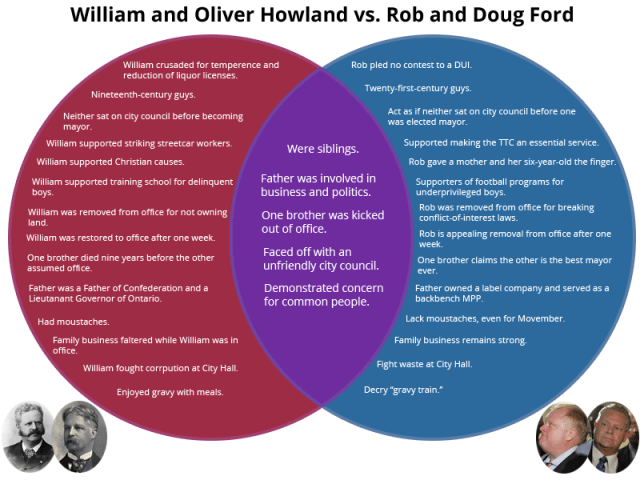 We whipped up a diagram to illustrate the parallels between the Fords and Howlands, just in case Doug Ford ever wears the chain of office. Click the image for a zoomed-in view.